’Readers familiar with my previous recipe posts will have realized that I’m not a very ambitious cook. This recipe is a prime example. It’s not a recipe you’d want to use for your Chili Cookoff entry—in large quantities it would be too expensive, and you’d wear yourself out opening cans—but for a family meal, it’s quite adequate. My husband insists he prefers it to any other chili he’s tasted. The recipe as I received it called for an ample quantity of chili powder, but it’s just spicy enough for me without. In a large stock pot, brown ground beef with onion. Cover and simmer until heated through. Serve topped with shredded cheese. Ranch Style Beans: I use the Original style, but you can also get them with sweet onions, red peppers, or jalapeños. If you can’t find these beans, you can substitute Bush’s Best Chili Beans, which come in Mild, Medium, and Hot varieties. In addition to these kidney bean varieties, Bush’s makes kidney beans in a spicy chili sauce. Tomatoes: The secret here is to get tomatoes that are already seasoned. I usually get Del Monte “Zesty Chili Style” diced tomatoes. Tomato Sauce: Again, take advantage of seasoning in the sauce. I usually use Hunt’s Seasoned Tomato Sauce for Chili. It appears, however, that this is being phased out in favor of Hunt’s Seasoned Diced Tomatoes in Sauce for Chili (Mild, Medium, or Hot), which doesn’t sound like the same thing, so I may have to try something different. Cheese Topping: We like Walmart’s Great Value Fiesta Blend. Makes about six servings—more if you serve it over rice, as we often do. Now that the Boy Scouts have decided to admit girls, there’s a big flap about whether girls are better off being traditional Girl Scouts or liberated girl Boy Scouts. Needless to say, this was a choice I did not have to make, and, even though I lived in three different cities and attended four different elementary schools between first and sixth grades, I did somehow manage to be both a Brownie and a Girl Scout. I remember almost nothing of my Girl Scout experience, but recently I’ve been reading the letters my mother wrote to her mother when I was in fifth and sixth grades, and she frequently mentions my Scout activities. Apparently my troop made arrangements for all the girls to earn badges together, and the ones my mother mentioned were Sewing, Home Nursing, and especially Cook. For the last I had to try several recipes at home and put together a cookbook of the recipes. I spent so much time decorating the cover that Mother ended up having to type up the recipes for me so I could turn my book in on time. I don’t remember what any of the recipes were, though I have a vague memory that my grandfather’s Deviled Hamburgers may have been one of them. I also remember a weekend at Scout camp and possibly a separate overnight campout. On one or the other of those occasions, we made Campfire Stew, which I recall as being composed primarily (or perhaps entirely) of ground beef and vegetable soup (or maybe canned mixed vegetables and water). I’ve adapted that basic recipe into one of our family menu staples. There are numerous Campfire Stew recipes available online. Many involve actual fresh vegetables—a bit labor-intensive for the woods, if you ask me, and certainly for my kitchen—but the Taste of Home version and Mom’s Campfire Stew, though both more elaborate, are not dissimilar to mine in some respects. Mine is definitely the lazy cook’s version, however. Brown ground beef in a large stock pot. Add soup and tomatoes and bring to a boil. Add pasta and cook for the length of time indicated on the pasta package (you can lower the heat and cover the pot). Ground beef: I get the 93% lean, so I don’t bother to drain it, but you may want to siphon off the fat if there is a lot. Soup: This should be ready-to-eat soup (not condensed). I usually use Progresso; the specific variety depends on what’s available in the store. Many of Progresso’s vegetable soups already include pasta, and I try to avoid those. Some that don’t are Vegetable Classics Garden Vegetable, Vegetarian Vegetable with Barley, and Zesty Southwestern Style Vegetable. This last, which is all I could find the other day, has the advantage of being a “Light” variety, and it was very tasty. Tomatoes: There’s a daunting variety of canned tomatoes these days—stewed, diced, petite diced, whole, crushed, etc. Pretty much anything will do. Many varieties include other ingredients that would change the seasoning of the stew: I used to be able to get an “Italian vegetable” soup and pair it with tomatoes with Italian seasoning. Be creative! This dish is very quick to make, serves 4–6, and makes a hearty supper on a crisp fall evening. On June 30, on the eve of Canada’s 150th anniversary, one of my Facebook friends reported that she had made “butter tarts” in celebration of Canada Day. I’d never heard of butter tarts, but on googling them, decided (quite erroneously, I think) that the description (“butter, sugar, and eggs in a pastry shell”) sounded a lot like the chess tarts my mother, Virginia Scoggins, used to make. Since her death in 2002, I had not had any of these delicacies, so my memory is somewhat vague, and a rudimentary search of my hand-me-down recipes turned up nothing. One of my brothers actually has the recipe scrapbook Mother made, but it is in storage somewhere, currently inaccessible, so I set out to see what I could find elsewhere. Thoroughly confused by now, I again resorted to the Internet to search for “chess tarts.” Among the recipes I found was one for “Buttermilk Chess Tarts” that sound absolutely divine. This recipe appears to be based on (or at least largely similar to) the “Miniature Southern Chess Tarts” recipe that was handed down by another Virginia, but neither of these is what my mother made. So I looked for a chess pie recipe that included vinegar and cornmeal, which I had decided (perhaps arbitrarily) were essential ingredients for authentic chess tarts. I ended up settling on this one. I have now made three batches of these and feel tentatively ready to share the recipe and some hints. Combine filling ingredients in mixing bowl. Bake 25 to 35 minutes until golden brown and firm. The pastry shells I used come wrapped in packages of two. The directions on the pastry shells package say to remove the shells from the protective wrap and let stand 10 minutes, then separate them. Do not do this! After my first two attempts, I had concluded that separating the pastry shells was the hardest part of the preparation because the bottom shell becomes gummy and sticks to the aluminum pan of the top one; it was almost impossible to get them apart without making a mess and breaking off pieces of the crust, and the bottom of the top aluminum pan was coated with grease from the bottom shell. The third time I unwrapped the shells and immediately separated them. They snapped apart without a hitch and in pristine condition. I think the first time I made the recipe, I melted the butter. The second time I softened it and used an electric mixer to “beat on high speed 3 to 5 minutes” per the original instructions. I didn’t feel that this made any difference except to take more time and trouble and require more washing up. If the butter is melted, you can use a wire whisk to beat the filling mixture, and you can have everything done in the time it takes your oven to preheat. I do think that next time I will add the melted butter to the sugar and beat, then add the other ingredients, saving the eggs for last. But that may not make any difference either. So far my tarts haven’t been very pretty (the photo is from the second batch), but they taste great! Although the ingredients above make for a very thin pie, they make just exactly the right amount to fill the eight tart shells. The filling will swell during cooking, creating a large balloon above the tart shell, but this will collapse rapidly as the tarts cool. Although you could ladle or spoon the filling into the tart shells, it is a lot easier if you make up the batter in a bowl that has a pouring lip. I used a plastic pitcher (basically a vintage Tupperware Mix-N-Stor® pitcher) intended for mixing Bisquick pancakes, and this was perfect. I was initially uncertain about the cooking time, but in fact it is about the same for the tarts as for the pie because the depth of the filling is equivalent. In my oven, the full 35 minutes is required. These tarts, once cooled, are easily removed from the aluminum pans and are best eaten out of hand instead of using a fork! My mother used to make several batches and freeze them, so I know they can be frozen. Who knows? They may even improve upon refrigeration! I’ve been casting about for another recipe to post, and eventually I’ll come up with something, but meanwhile here is something that is more instructions than actual recipe. We just call it “Spinach-Garlic Tofu” (though it could equally well be “Garlic Spinach Tofu”), and it started as an attempt to replicate a dish my husband used to enjoy at a Chinese restaurant where he often ate when he was working in Mobile. Never having experienced the entrée myself, I have no idea whether this even comes close, but it’s a staple in our house, anyway. Here’s what we’ve evolved. Spinach: You can go to the trouble of using fresh spinach if you’re really ambitious, but I usually settle for a one-pound bag of frozen chopped spinach. Garlic: One entire bulb, peeled and minced. Lately I’ve started using a mini food processor to mince it—it’s a lot faster, and there’s not much waste. Tofu: One package, 12 to 16 ounces, diced into ⅜″–½″ cubes. I get whatever Walmart has on the day I’m shopping (Mori-Nu, Nasoya, Azumaya), usually Firm or Extra Firm; I think this is what I got last time. In a 12″ skillet if you have one (I have only 10″, so I use a large stock pot), heat two tablespoons of oil (I use olive). You may want to add a large quantity of salt, though it won’t do any good. No matter how much salt you add while cooking this, it will need more when you eat it. Sauté the garlic and tofu briefly, then add the spinach. If you are using frozen, you may want to thaw it first, but it’s actually easier to get all of it out of the package if it’s still frozen, and it thaws quickly in cooking. If you’re using fresh spinach, you will also need additional time to cook it down. Cover and simmer “awhile”; serve over cooked rice. I generally start heating the water for the rice about the same time I start heating the oil, which means that the rice is ready in 20 minutes or so, at which point the spinach concoction should be ready to serve as well. This makes four hearty servings, so I make four servings of rice as well. A couple of days later, when we have the leftovers, it will be even better because the flavors have had more time to mingle, and preparing it just requires putting the rice in a bowl, covering it with the spinach mixture, and microwaving (covered) for a couple of minutes (the photo above was taken of the second outing). Needless to say, this is very garlicky. You will not need to worry about vampires, but you may find that friends who have not shared your meal will also give you a wide berth! Just a few more photos of the only construction site I’m still actively monitoring. The front porch has been screened. Here’s how it appears from the street and from the entry (the door has not yet been screened). The previously unidentified wiring beside the door (above the doorbell) is now attached to a Seco-Larm Enforcer security camera. The house was securely locked up today, but, peering through the sunroom door, I could tell that the kitchen faucet and handle have finally been completely installed. The Badger box was no longer on the counter, so I assume the disposal has also been installed. Making a circuit of the house, I found this attractive hose reel. And the rear courtyard now sports a fountain. Here’s a view of the finished rear entrance, with a close-up of one of the lanterns. Later editions of the code provide more succinct but similar definitions. The term “vertical pack” can’t be found in recent editions, which is not surprising since the beans themselves are so hard to come by. Google did find one supplier, Tillen Farms, which apparently sells them both in jars and canned. This dish can be made with ordinary whole green beans; they’ll still taste good even if they’re served higgledy-piggledy, or you can make an effort to straighten them out as much as possible before serving. Or you could cook beans from scratch and lay them out vertically to cool. For the most elegant presentation, however, you do want the beans to be parallel. The dressing could also be used on asparagus, which doesn’t present the same sourcing problems. Arrange two cans of vertical-pack whole green beans in a baking dish or serving container. Top with onion rings, a tablespoon (or more) of oil-and-vinegar (or Italian) dressing, and Spice Island cracked pepper. Chill in refrigerator for an hour or more, then drain and serve cold with this dressing on top. Update: I have found that Walmart has what are essentially “vertical pack” fresh green beans in its produce section. 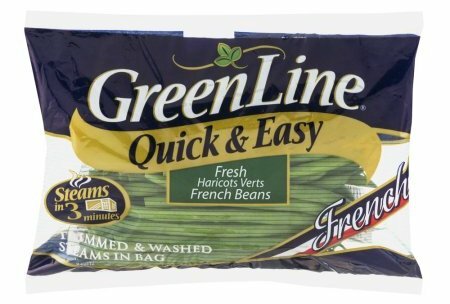 These Green Line beans come in the 8-oz. size shown and also in a 12-oz. size. This seems not to be a Walmart brand, so they are probably available elsewhere as well. I thought I had written the last of these reports, but this weekend 252 N. Bayview was unlocked, so I have a few more photos to share. Framing has been added for a screened portion of the front porch. The painter’s tape and signs are to bar entrance before Monday, June 12, after a second round of floor finishing. Inside, kitchen appliances have been installed, though plumbing in the sink is still not complete, and the Badger garbage disposal is still out on the counter. Appliances that have been installed include the GE Café™ Series 36″ Built-In Gas Cooktop with GE Universal 36″ Telescopic Downdraft System, the GE Café™ Series 30″ Built-In Single Convection Wall Oven, the GE Café™ Series ENERGY STAR® 27.8 Cu. Ft. French-Door Refrigerator with Hot Water Dispenser, and the GE Café™ Series Stainless Interior Built-In Dishwasher with Hidden Controls (or similar). An “aerial” view from the stairs. This shot shows all the connections required for the cooktop and oven. I had wondered about the undercounter placement of a microwave oven. It turns out that the Monogram oven is a top-loading drawer-style model. In the master bedroom, the glass doors and partitions to be installed in the shower stall. In the upstairs hall bathroom, shower doors have already been installed. In the en suite bathroom, the Ara® Single Handle Vessel Lavatory Faucet with Channel Spout has now been installed. A tiled backsplash has been added in the “break room” at the top of the stairs. Downstairs, in the den, there are new built-ins. In the foyer, shades have been added to the Lorraine Architectural Railing Sconces from Restoration Hardware, and a chandelier has been hung. This extended fence and garish gate were added last week. The house is in the process of being (re)painted white. The blue paint on the window frame suggests that perhaps the blue-and-white color scheme is being contemplated for the house as well. Closed blinds at all the windows make it difficult to tell what (if anything) is being done inside. The large red-brick house at 120 N. Summit (corner of Oak Avenue), seen here in an April 2011 Google Street View, is being painted. And our neighbors at 60 N. Summit seem to have installed “burglar bars” around their porch. Not sure whether this is to keep pets/children in or malefactors out, but the new fencing certainly presents an odd appearance.